Product prices and availability are accurate as of 2019-04-19 05:29:00 UTC and are subject to change. Any price and availability information displayed on http://www.amazon.com/ at the time of purchase will apply to the purchase of this product. 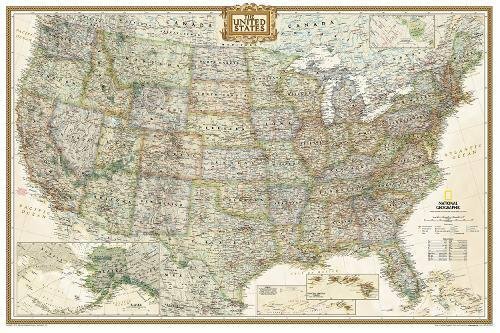 National Geographic's Executive reference map of the United States features all 50 States with insets for Alaska and Hawaii in antique-executive cartographic style. Each state is colored to clearly define borders and shaded relief accentuates geographical features. All major cities, transportation routes, state boundaries, National Parks, lakes and rivers, and mountain ranges are clearly displayed and labeled.